North Port’s Emani Jefferson is just a junior but has already eclipsed the 1,000-point mark. She is 653 points away from 2,000 points and is 14 points off the school’s girls record. 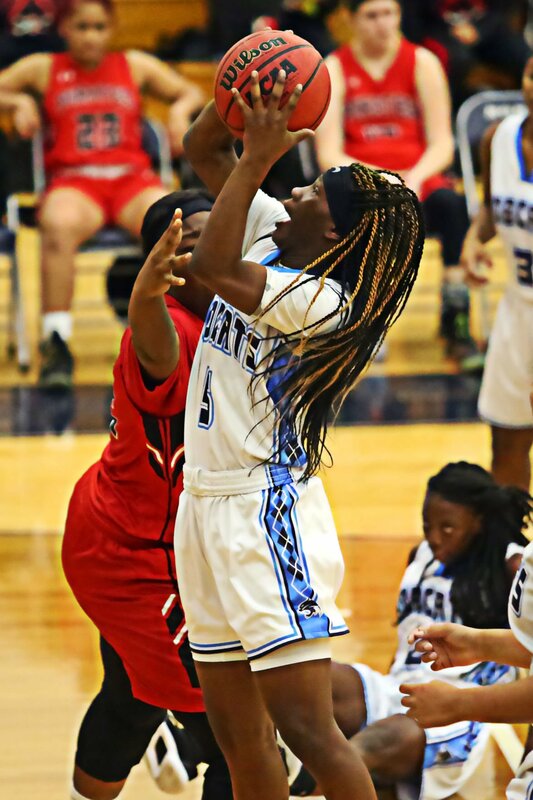 North Port’s Emani Jefferson twice broke the school’s single-game scoring record with two 40+ point games in two weeks. North Port’s Emani Jefferson drives in for two of her 24 points against Venice on Tuesday night. It’s sometimes hard to get a word out of North Port’s star guard, Emani Jefferson. A humble and sometimes shy girl, she mostly keeps to herself. That is until she puts her sneakers on the hardwood. Then, everything changes. At 5-foot-5, Jefferson can handle the paint, pull down rebounds over taller defenders and score from just about anywhere. It has made her one of the most dynamic players in school history and one of the hardest players to guard in southwest Florida. “Pure speed” is how North Port coach Dale Huffman would describe her. Jefferson’s dominant play has come out of necessity at times. Sometimes she’s forced to carry the load, other times she welcomes the challenge. Regardless, when the Lady Bobcats need points, Jefferson is there to oblige. But with that comes immense pressure. Jefferson’s scoring hasn’t always come the same way. In previous years she’s relied more on her drives and layups, which are still lethal. But this year, she’s added more of a midrange game and broadened her range beyond the arc. As if she needed more tools in her arsenal. Jefferson led the team averaging 29 points per game and broke the school’s single-game scoring record twice in the span of two weeks with two 40+ point games. But Jefferson’s scoring is just part of what makes her so special and what has led her to back-to-back Sun Player of the Year Awards as a junior. She can really do it all. Not only did she lead in scoring, she also recorded five triple-doubles, 13 double-doubles, grabbed eight steals a game and 13.5 rebounds a game. Remember, she’s only 5-foot-5. She can leap out of the gym and has never really let her size hamper her drive to compete at the highest level. She’s always been smaller than most people on the court, but that’s never fazed her much. When she was in middle school, North Port High would host the “Cross-town Showdown,” featuring the two area middle schools. Coming into the game, all eyes were fixated on a player from Woodland Middle. At the time, Jefferson wasn’t the hot commodity she is now. Jefferson ends up guarding the top scorer, who had been shouldering the scoring load for her team. By game’s end, Jefferson was pushing 30 and held the other girl to single digits, according to Huffman. “From that point on, everyone knew her name,” Huffman said. “She actually plays better in the bigger games. She’ll go out and do what she needs to do, but you throw a team like undefeated Dunbar and she goes off for 43. That’s what makes her so hard to guard. She’s a versatile threat with a desire to rise to any challenge. Coming off an impressive sophomore season, the Lady Bobcats lost two seniors, but added senior Katelynn Hall, who helped Jefferson grow even more as a player. The duo began to click and thrive in an already potent offense. That helped Jefferson reach a major milestone on her way to history. She eclipsed the 1,000-point mark and is 14 points from the girls career mark. But that, paired with Division-I offers already, isn’t all that she’s after. Huffman expects her to become the first player in North Port history, boy or girl, to eclipse 2,000 points. 653 points away, she would have to average 24 points per game to reach her goal if North Port plays a similar number of games next year. “We had one guy, Shaun Noriega, that went on to play at USF. He could shoot lights-out, and he didn’t break 2,000 points,” Huffman joked. “It would be a big deal, the school’s first 2,000-point scorer. It’s hard to do.